Machine Pallet Wrap are longer rolls than Hand Stretch Wrap Rolls and are also have a wider core to fit the dispenser on the pallet wrapping machines. Omni’s high performance machine pallet wrap offer significant film cost savings while reducing environmental impact. 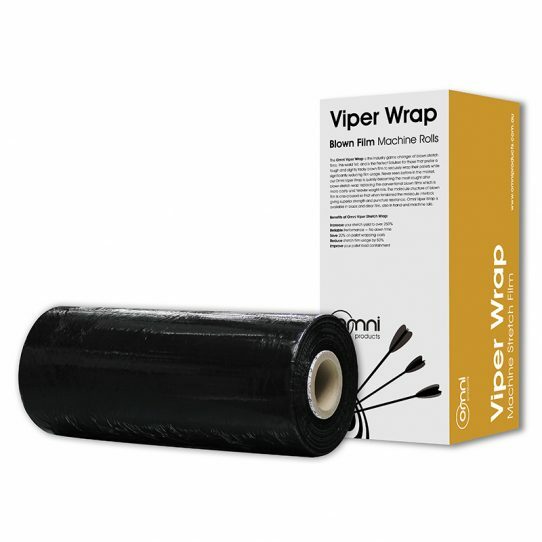 Omni Machine Stretch Wrap can stretch to over 400% when dispensed on the award winning Omni Pallet Wrapping Machines. Our Machine Pallet Wrap is available in a variety of colours, lengths and grades to suit every pallet load type and wrapping requirement. 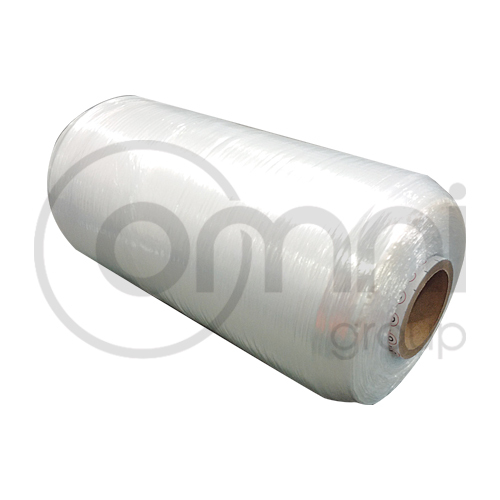 Machine Wrap is commonly divided into two main categories; cast and blown film types. Masterwrap: developed as an alternative to cast conventional films with great cost & film savings. Available in 20um, 23um, 25um strengths. Most popular of all stretch films. 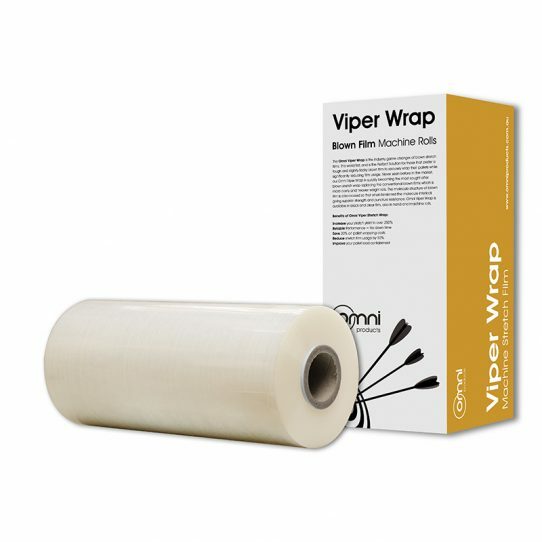 Viper – Stretch Wrap: a tough heavy duty blown film for a secure load containment while reducing film by at least 40%. Available in natural and black film. Euro – Stretch Wrap: the highest performing stretch film on the market guaranteeing up to 70% reducing on stretch film. To be used in conjunction with the Omni Pallet Wrapping Machines to deliver “The Perfect Pallet Wrapping Solution”. Elite – Stretch Wrap: “thinner, longer, stronger” stretch film with a special formulation to stretch over 300% with great puncture resistance, saving on costs and film. Dynamic – Stretch Wrap: Pre-stretch film used to reduce the need to pull extra tension whilst applying the stretch film as it has been already stretched. Conventional – Cast Stretch Wrap: regular cast stretch film available in 20um, 23um, & 25um. Conventional – Blown Stretch Wrap: regular blown stretch film for those that want a tougher and tackier stretch film than cast film. Used when pallets are heavy and an irregular shape with sharp sides. 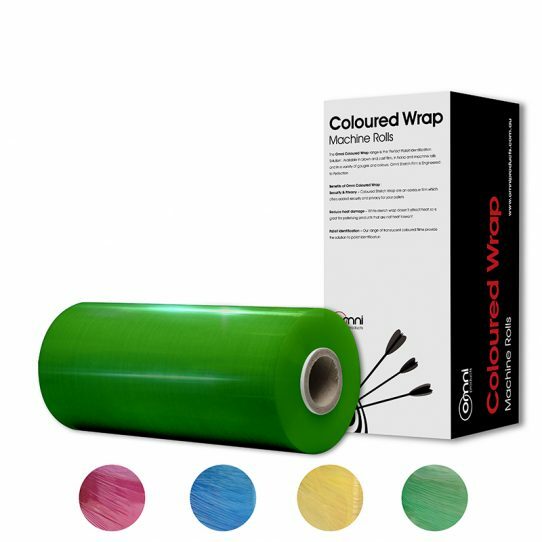 Coloured – Stretch Wrap: coloured stretch wrap used to make your pallets stand out, reduce heat damage and ensures your pallets aren’t tampered with. Colours available are red, blue, green, yellow, white and black. Contact us for advise on what type of Machine Pallet Wrap is best suited for your application! 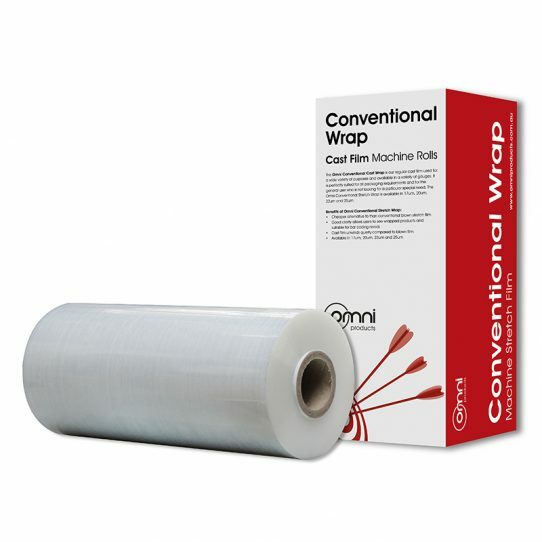 The Omni Masterwrap range has been developed to replace the conventional stretch films to be a cost effective pallet wrapping solution while reducing environmental impact. Regular cast stretch film available in 20um, 23um, & 25um.